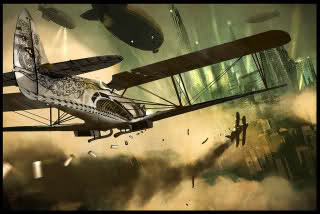 A place for my lovely steampunk friends to play! JelDhen wishes he were an airship pirate, though the best he could bring himself to do was to become a multinational privateer. That, of course, is something of which is very proud, though may refer to himself simply as a "pirate" in certain circles (often times with finger-gestured quote marks around the word). He is, in many senses, a wizard. Though in the most common sense he is a tinkerer, a tech inventor. He can usually be found working on some crazy invention or another, anything from audio reproduction to computer displays or just a new interface for the Airships in which he flies, or captains. He has leadership skills that are very untapped, and would probably flourish best with a very small crew. Everything else waits to be written! Gabe is Amazonian in origin, born and raised in a reclusive tribe of nomads in northwestern Brazil. In short, she's multilingual, recognizable physically by the streak of green tatoos she has across her face, and very much disowning of her heritage... to the extent that she refused to stay confined to her tribe and has since fled her home to the academy, and one day to the skies. Gabe holds a dark secret, one that could endanger everyone around her if she were to let her life get out of balance. Your Academy page will be up shortly! Select a forum||--Welcome Welcome!| |--Announcements!| |--Intro and Application| | |--Introduce yourself!| | |--Apply today!| | | |--Ship Registry| |--Shadow Cast Chronicles|--Randomly Awesome RPing|--OOC Chat |--Games to play |--The Art Gallery |--Magic Story Time!